A lot of people are afraid of going to the dentist. The drills, the sounds, and the smells can create a unique sense of unrest in patients. We can try to deny this fear all we want, but it is the unfortunate truth. That is why most dentists use some kind of dental anesthesia and sedation dentistry during dental procedures. Dental anesthesia and sedation dentistry have a number of benefits that help patients, and that is why University Dental Family Dentistry and Orthodontics uses dental anesthesia and sedation dentistry. Below we list the benefits of dental anesthesia and sedation dentistry, and if you are interested in learning more contact University Dental by calling (619) 473-2565. For some long or complex procedures, patients can get a little uneasy thinking about the intense machinations that will be occurring in their mouth. Anesthesia and sedation dentistry helps patients gain a sense of comfort, no matter how nervous they are. This benefits the patient and the dentist. The patient is more at ease, and that means the dentist can go about their job without an overly tense patient causing them stress along the way. There are a variety of elective dental procedures that can help patients look and feel better. However, their crippling fear of the procedure prevents them from undergoing these clearly helpful procedures. Sedation dentistry and anesthesia allows a patient to get the courage and the comfort they need to choose to go with elective procedures they otherwise would never even dream of undergoing. Sedation dentistry and anesthesia can lessen pain, helping the patient to feel as little discomfort as possible. It is our goal as a dentist to complete procedures with as little harm done to the patient as possible, and sedation dentistry and dental anesthesia allows us to complete this goal. In some cases, the patients may not even feel any pain or discomfort at all! During a dental procedure, relaxation is key. The size and scope of the problem area and instruments mean there is little to no room for error. The amount of precision needed for dental procedures requires that patients stay as still as possible, as any movement can mean a crucial mistake. 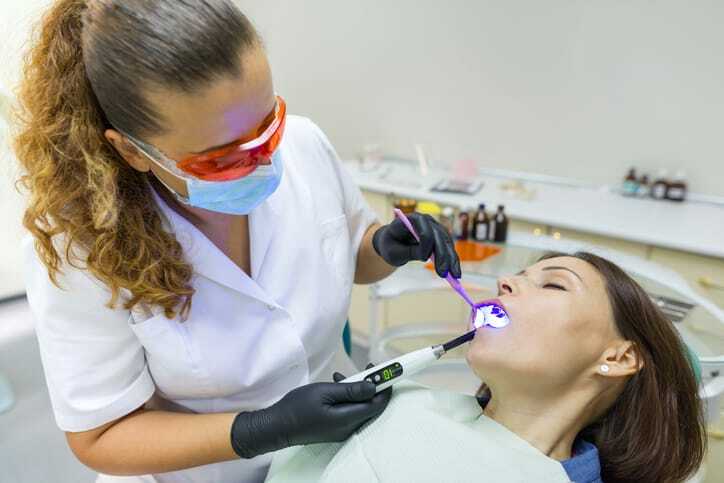 By sedating the patient, it allows the dentist to go about their work without fear that one quick shudder or spastic movement can cause a dental disaster. Sedation dentistry and dental anesthesia have a number of amazing benefits, and any dentist you go to should be experts in sedation and anesthesia. At University Dental in San Diego, our dentists and specialists are trained in sedation and anesthesia, helping patients relax and enjoy dental treatment with minimal discomfort. If you are interested in learning more or would like to schedule an appointment with University Dental, give us a call at (619) 473-2565.